Moon Bear is a great pick for three reasons. First, this picture book will grow with kids. The text is simple enough to engage young children, but the endnotes will interest older ones who are reading themselves. Second, Ed Young’s illustrations are certain to mesmerize adults and children alike. His use of collage provides depth, while the overall compositions are lyrical and stunningly simple. It’s the third reason — the subject matter of the book — that will appeal to Vegbooks readers most. 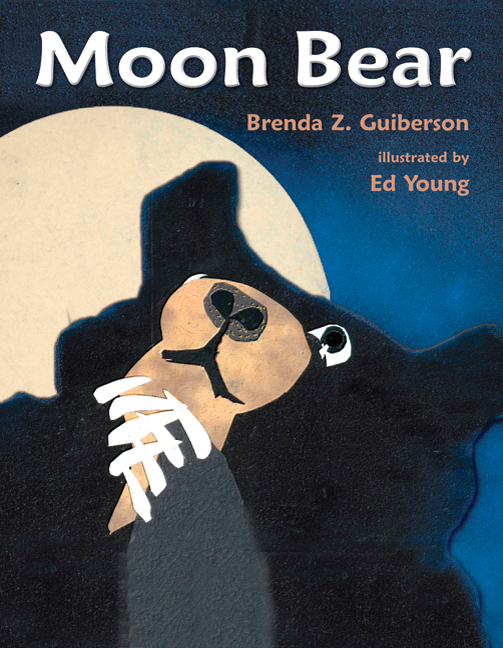 After you and your child have spent five minutes with this book, you’ll know all the basics about moon bears in the wild: what they eat, where they sleep, and what they do. Spend five minutes more with the resources listed in the endnotes, and you’ll know all about their exploitation on bear bile farms too. Seven years into raising a vegan kid, I think the greatest challenge I’ve faced as a mom is ensuring that I’m honest with my daughter about animals without overwhelming her with the gruesome facts about how people exploit animals at every opportunity. Books like this one allow parents to make decisions about what their kids can handle. You’ll want to skip the endnotes with young children (although I recommend you read them! ), and the smaller font and more advanced reading level will discourage precocious readers. But when your kiddo is ready, as mine is now, reading the endnotes together can provoke an interesting dialogue. There is so much to discuss — animals in captivity, animals in medicine, animals as healers — that I expect this text would also be useful in humane education. I recommend this book for children ages 3 to 7. Let’s continue the conversation in the comments! Please tell me about how you’ve introduced vegetarianism or veganism and related issues to your child, and how the dialogue has changed as your child has grown. Have any books been particularly helpful? I think our dialogue went from “we don’t eat animals” to other things as their own questions drove discussion. Early on our daughter wanted to know why we didn’t eat animals and which of her friends ate animals or didn’t. That let us discuss how people we care about may make different choices and why their choices are different. What they love is identifying with characters in books that are making meat free choices. Many books that depict animal families are good choices for veg kids because that lets them relate to the relationships and feelings of animals. Homa, thanks for your thoughts! I actually held off telling kiddo that other people ate animals for a while. We said we didn’t drink milk because it belonged to the cows, or eat eggs because they belonged to the chickens. When kiddo did finally ask about meat and I told her it was the muscles of animals, she was stunned that people would kill animals for a meal. I understand the feeling. My 4 kids have always been vegan, and I was very frank about where animal products came from, right from the beginning. I added age-appropriate information as they grew when they would ask. I did find myself editing some words in books when they were younger in order to veganize an otherwise good story. When I interviewed grown-ups about their vegan childhoods for the Born Vegan episode of the internet radio show The Vegan Option one of the most interesting questions was about how the parents described animal abuse to them. So it’s a live issue. I particularly remember that Andrew felt empowered in conversations with schoolmates – because he was the one who really knew where the food came from. The show is available to listen online, should you be interested! Ian, I’m listening to the podcast right now – so interesting – thanks for sharing!